The new Pangolin BEYOND 4.0 as professional laser light software brings along a lot of new awesome features to give all the creative laserist tools to bring their imaginations to life. But software only, as perfect as it may be, is only half of the story. You also need powerful ILDA capable laser controller hardware to realize the commands that come from the mighty software side. So software and hardware needs to be perfectly coordinated to create a stunning laser light result. 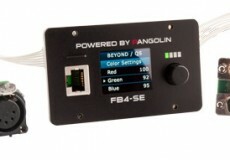 And that is what the Pangolin BEYOND software and FB4 network laser controller hardware is all about. It's the professional affordable laser software with a harmonizing hardware that makes it so famous all over the world. And with the enhancements in BEYOND 4.0 for the FB4, the control and use of that combination is more convenient and efficient than ever before. John Ward from Ninja Laser did a great tutorial series about the many features the new BEYOND 4.0 software offers you to interact with the FB4 hardware laser controller. 1. The first tutorial is an introduction and about the FB4 settings within BEYOND 4.0 for the FB4. 2. The second video of that tutorial series is about the different Export types for the FB4 as well as how to upload and use those exported files, with an example for Test Frames. 3. This tutorial series for the FB4 laser light network controller is concluded by the third video that is about how to use the FB4 Export option to prepare to control the FB4 via DMX by a lighting console without a PC. And the tutorial also shows one step ahead and demonstrates what to do to get rid of an external control unit and only use the FB4 network controller as stand alone device in autoplay mode.